Starting in 2020, Major League Baseball will change forever. It will impose a new rule forcing relief pitchers to face no fewer than three batters, unless the reliever gets injured or the inning ends. The league wants fewer pitching changes and shorter games. Imagine it’s 2010, or 2012, or 2014, the years the Giants won the World Series. Imagine their manager, Bruce Bochy, a future Hall of Famer and a brilliant baseball strategist, isn’t allowed to use his bullpen the way he wants. Isn’t allowed to bring in left-handed specialist Javier Lopez to face only one hitter, a lefty, before being removed, or isn’t allowed to bring in right-handed specialist Sergio Romo to face only one hitter, a righty. Imagine Lopez and Romo each have to face three hitters, potentially both righties and lefties. Would the Giants win three World Series? Estes is vehemently against the three-batter rule change, as are fellow former Giants pitchers Vida Blue and Bill Laskey. Why are they letting these arcane rules be established willy nilly? They should experiment during spring training, the garner feedback. The players and managers seem to be universally opposed to this rule, and it will destroy long established traditions and strategies. As long as they make sure the pitchers’ tongues are not wagging causing a .0000013% drop off in velocity, I wholeheartedly agree. I know my sexxxy mustache was causing me problems while throwing… definitely lost a hair of velocity on my 120mph curveball in my rec league days. But on the bright side I could use it to dust off the plate and score favors with the home plate umpire. It’s crazy. I don’t see any redeeming value to making this change. The league’s decision at curtailing the time of games should never interfere with the managers strategy. Last year’s decision to cut game time by sending a hitter to 1st base in a walk situation was ok, but it also removed the possibility of something crazy taking place. I remember a pitcher throwing the ball over the Catchers head in a walk situation that allowed the winning run. With teams now paying astronomical contracts, it puts the league in a vulnerable position to make the game more bearable for their custumers. I can see how making some changes may help, but I’m also of the mindset that you don’t need to fix it, if it ain’t broken. The league needs to realize that the traditional baseball purest made this game popular. what a dump Oakland is! Funny. 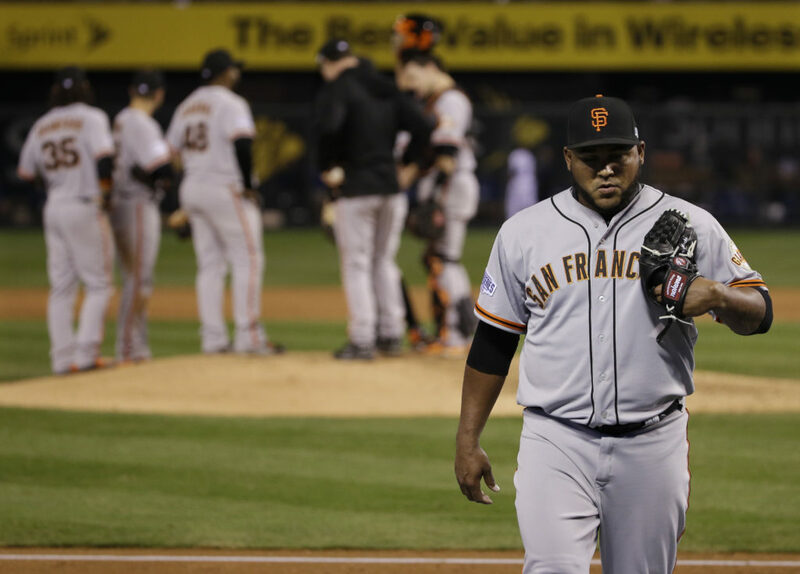 Vida considers himself a Giant and is active today with the Giants (read: NOT A’s) organization. When your a’s can win a championship in this century give me call. Until then, try to get your ownership and city to build a stadium you can be proud of. If they really want to speed up the game change it to 3 balls and a walk and 2 strikes makes an out. Won’t be baseball but the game will move faster. They want more scoring so move the fences in to no more than 225 feet. Count a foul ball as a ball so there will be more walks, and more base runners. Only allow 3 pitchers per team per game, that will increase scoring. If at the end of an inning one team is up by more than 6 runs the game is over. Elimate pinch hitters,if you come in and hit you are required to play in the field for at least one inning. Only allow 2 minutes between innings. Allow each team to have 2 designated hitters in the lineup. All the above changes will speed up the game or up the offense. It won’t be baseball, but it will make TV happy. Funny, yeah it’s not baseball but I’m kinda with you on the 3 balls is a walk. That would make the pitchers maybe pitch better and there would be more baserunners and more uns. No more 3 hour 1-0 boring games. You have to keep 3 strikes. On the foul balls, what if they said after hitting, say on the 7th foul ball you’re out. At times it gets crazy watching a batter hit like 8+ foul balls and more until he’s finally out or gets a hit, slows the game up!…5 pitchers per team per game. At the end of the 7th or 8th inning a team is up by 7 runs, games over. 2 minutes between innings, I guess that’s enough time for commercials that need to be shown. A pitcher can only throw 3 pick off throws to 1st per runner. A coach can come out to have a meeting on the mound only 1 time per pitcher. Hopefully games would be 2 to 2.5 hours max. and no more 1-0 games but not too many runs either. If they want to speed up the game, enforce the 20 second pitch rule. Laskey rightly says that there will be more faked injuries, which take more time. Estes wants the batter to stay in the box. Those changes will speed up the game, not some unpopular arcane rule which emasculates the manager.